At the Cayman Cookout, the humanitarian-chef opened up about World Central Kitchen and why he feeds "people of all parties." 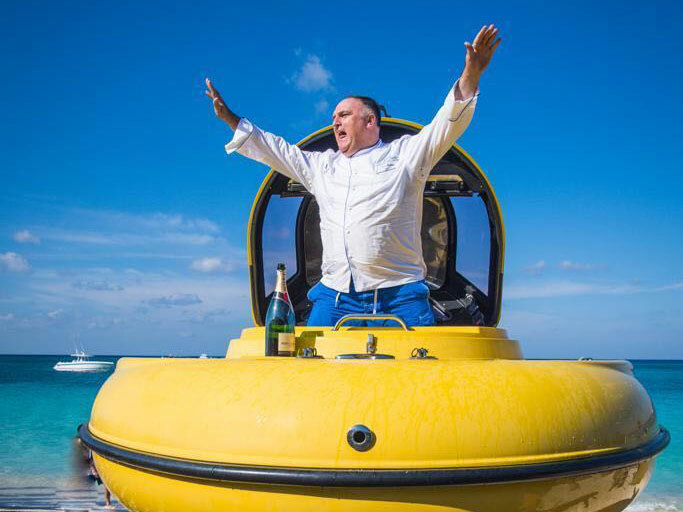 Every year during the Cayman Cookout, located at the Ritz-Carlton Grand Cayman, José Andrés makes a grand entrance before his cooking demo—last year, he jumped off a helicopter and swam to shore. The year before, he rode in on a horse. This year, Andrés rolled up in a tiny yellow submarine, which emerged on the shore as he began spraying Champagne onto the crowd. While his Friday morning paella demonstration was full of levity (and vodka shots), Andrés opened up about his work with his organization World Central Kitchen, which feeds people in crises around the world and here in America. In addition to helping lead humanitarian relief efforts in Puerto Rico after Hurricane Maria and other places hit hard by natural disasters (most recently, California, North Carolina, Indonesia, and Florida), Andrés stepped up just last month to help feed furloughed federal employees who had no source of income after the government shutdown, offering them free meals at all of his D.C. restaurants. And this January, Andrés opened a kitchen in D.C. to feed these workers and their families. During his demo, the chef said that WCK plans to open more kitchens around the country to help families who are struggling in light of the shutdown, if it continues. "We are about to announce next week that if the shutdown of America doesn’t end soon, we will be opening 20 other kitchens around the country," he said during his demo. To Andrés, the move is not a political one, but rather a human one. "We feed people of all parties," he said. "We opened a kitchen because right now we have workers who are in pain...I’m a guy that believes in building longer tables, not higher walls. I have friends of both parties, and when we are around the table, somehow, everybody knows where to find common ground. And we respect each other, and that’s the way it should be—in America or anywhere around the world. If anybody’s hungry, we will be there." In addition to discussing all of his humanitarian work, Andrés took ample time to roast his friend Eric Ripert and make fun of French food, as well as the cuisines of Britain, Italy, America, and basically everywhere that's not Spain. When one audience member asked if she could use arborio rice in her paella, Andrés had a field day. "Listen to me, if you are in the middle of nowhere, and arborio is the only thing you have, use it," he said. "I will never speak to you ever again and you will never be allowed to travel in Spain again, and my heart will be broken, but it will be an okay substitution."